Interpreter certification is akin to licensure in many other professions such as psychology, occupational therapy, social work, professional counseling, architecture, or nursing. 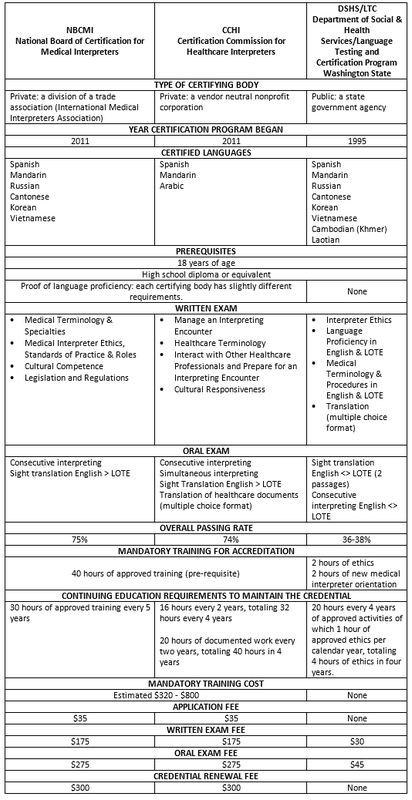 In the United States, there are three certifying bodies for medical interpreters: NBCMI, CCHI and DSHS/LTC (see chart below). Interpreters will have to choose which certification to pursue based on their working languages, the availability of testing sites, the delivery modality (on-site v. remote interpreting) and the applicable federal and state laws and regulations. In the State of Oregon, the Oregon Health Authority is the government agency responsible for regulating medical interpreters.